This eight-week course is designed for the beginner to intermediate drawing student who wants to explore the traditional mediums of a drawing course. This course is perfect for a college student who wants to develop their drawing skills for a their portfolio. We will experiment and use graphite, charcoal and India ink. We will also explore and emphasize various elements of design in our drawings including value, line, form and shape. We will also be learning how to train the eye and hand to coordinate to make accurate drawings on paper. All materials are provided. Week One: Introduction of Graphite: Contour Drawing: Still life of a Cone, Sphere and Cube. Elements of design to emphasize: Line, Form and Shape. Week Two: Graphite Continued: Value study. Still life of vegetables: Emphasizing element of design of Value, Form and Shape. Week Three: Graphite Continued. Choice of Value or Line emphasized. Still life. 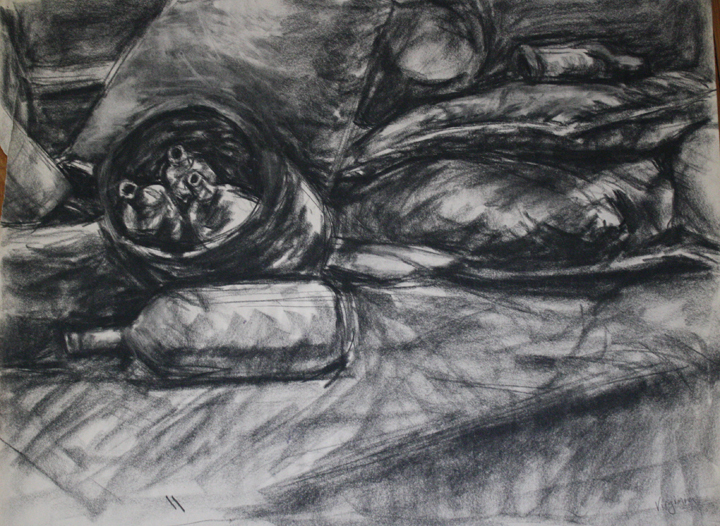 Week Four: Introduction of Charcoal: Emphasize Line and Value. Still life of eggs. Week Eight: India ink: Still life of abstracted Doll.